"I believe the most important thing to remember is that there is not only one right way to do something. Life has no checklist, and so there is nothing that you are missing unless you yourself decide that you are missing it. That's why it's very important to pave your own path in college!" "Miami had always been on my radar, because my grandpa earned his MBA here in 1953. In high school, I began reading about Miami's high Princeton Review rating, and when I visited I was very impressed by not only the faculty's dedication to undergraduate education and research but also their general availability to educate and advise. On top of that, I was offered a very generous merit aid package, which sealed the deal! "My interest in being pre-med came from wanting to study people and the reasons for their actions and interactions, but for a while I didn't know where to focus my major. I came in as an Anthropology major, switched to Psychology, and then ultimately landed in Biology. I've also been able to explore the humanities side with my English Literature and History minors. "I came in as an Honors student and lived in Tappan Hall, but as a homebody I was very homesick my first year. However, I have grown to appreciate the opportunities that being a Miami student affords, whether that be through Honors, study abroad experiences, or the friendships I have made in and out of the classroom. And once I started planning my study abroad and research options, I definitely made a lot of good connections with professors. Doing all this helped me begin to carve out a place for me at Miami. "No matter what my interests are, I always leave professors' offices feeling very enabled — whether that be through talking about what we studied in class that week or my future goals. I've also received a lot of academic support when applying for grants and scholarships, including the CAS Dean's Scholarship and various Honors projects I've been interested in doing." "Being a member of the Scholar Leader Community in the Harry T. Wilks Leadership Institute has been one of my greatest highlights at Miami so far. As a living learning community (LLC), it was a place where I was able to really thrive. A group of around 70-75 student Scholar Leaders live in both Stoddard and Elliott Halls in a self-governed manner that includes lots of different programming, activities, and retreats throughout the year. It was even easy to just hang out in the lounges and make friends! "The CAS Dean's Scholarship, which I just started my final fall semester, has also been showing a lot of promise. I've been working with professor of sociology and gerontology Scott Brown on the effect of healthcare infrastructure measures (such as hospital and physician density) on diabetes prevalence using geographic-weighted regression. So far our research has been accepted as a poster to two conferences, and we're working on the final edits for a paper submission. Through the support of Dr. Brown and his research group, I was named first author on both the posters and the paper! 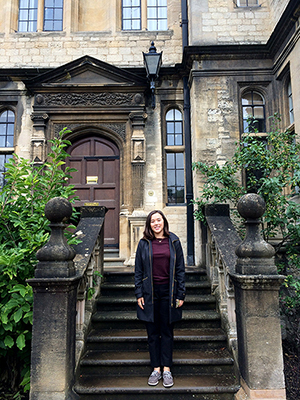 Morgan Nguyen poses in front of Trinity College, University of Oxford, United Kingdom. "Another great experience was my study abroad program at Oxford University in the UK, which was through a third-party program. I studied comparative health policy taught by Oxford professors and tutors. It was a rewarding experience to make friends with a new set of students from all over the world. "Here at Miami, my three most important relationships with faculty have been with professor of biology David Pennock, professor of English Katie Johnson, and professor of chemistry and biochemistry Ellen Yezierski. "I only had Dr. Pennock once in a seminar class, but as the director of the Mallory-Wilson Center for Healthcare Education, he has been very helpful as my premed advisor. He has assuaged my worries by offering me confidential and calming advice about my interest in attending medical school after graduation. His premedical seminar helps you get acquainted with the nitty-gritty of applying to medical school. While my classes at Miami overall have helped me build critical thinking and interpersonal skills, the Mallory-Wilson Center has been very helpful in terms of offering different programming to expose premed students to shadowing and research opportunities. I've been able to meet and learn from many alumni physicians. I have enjoyed serving on the Student Advisory Board. "My interest in literature and writing had long been dormant, since I didn't know whether I wanted to pursue it academically. But when I took Dr. Johnson's Introduction to Literary and Cultural Studies class (ENG 298) my junior year, she really helped me build confidence as a writer, providing very positive feedback on my essays and making me aware of different avenues to pursue outside of the classroom. "Finally, I had Dr. Yezierski for CHM 142 [College Chemistry] my freshman year, and then I was her undergraduate assistant in 2015 when I became a sophomore. 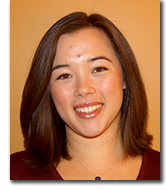 She is amazingly positive and supportive, with a dedication to the science of teaching. In fact, a lot of her research is on how best to instruct chemistry. She can really reverse a student's self doubt, and it is amazing to watch her teach and inspire — both in the classroom and office hours. It is really cool and fun to be around her encouraging and bubbly personality; one can't help but leave with a smile." 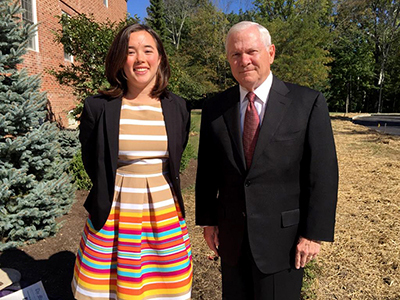 Morgan was a senior staff writer when she interviewed Dr. Gates for The Miami Student. "To put it succinctly, a liberal arts education trains one in the skills of the everyday world, and this really becomes the foundation for your future career. While engineering and business may be more specific and technical, the liberal arts builds your academic character as a scholar. "For me, biology has been my most practical subject, as it covers many of the premed prerequisites and allows me the flexibility in my schedule to pursue other minors. I like its concrete and organized technicality. I feel it's very important to have a balance between concrete and abstract thinking, which I achieve through my humanities minors. I love using both sides of the brain, but since I know I'll get plenty of science in medical school, being an undergrad will be my last best chance to also delve into the humanities — hence my English literature and history minors! "Some of the most impactful courses I've had so far were actually two tutorials held at Oxford University. One was in comparative health policy, and the other was in public health. As introductions to the social determinants of health, they really solidified that I want to combine public health with medicine in my career. In fact, it was this experience that led me to apply to Dr. Brown's sociology research project as a CAS Dean's Scholar. "I’ve also really enjoyed an upper-level biochemistry course with associate professor of chemistry Carole Dabney-Smith, who was an energetic teacher. The course brought together all these elements that we've been learning in other pre-medical classes. There are a lot of enzymatic processes to follow, but by memorizing these various biochemical pathways as stories, I could see my all different disciplines coming together." Morgan describes her service learning experiences with the Scholar Leader Community program, including a Winter Immersion Service Experience (WISE) trip to St. Louis in January 2016 to help out at a food pantry and community art center. "I believe the most important thing to remember is that there is not only one right way to do something. Life has no checklist, and so there is nothing that you are missing unless you yourself decide that you are missing it. That's why it's very important to pave your own path in college. "Miami is a relatively safe environment to make mistakes. Try taking a class you would not have had a chance to take in high school or won't in the future, or try a summer internship in a field that sounds interesting, or ask a professor about their research. None of this means you're committing right then. Even if you don't have specific questions about a class, take advantage of faculty office hours. They can give you career advice or recommend other classes. Ask questions and build a relationship. These professors have such a wealth of knowledge and experience that really only a fraction of that is distilled or shared in a classroom. Taking advantage of their office hours will really enrich your education. Don't be afraid to take a risk or do something outside your prescribed boundaries, whether those boundaries relate to your major, career interest, or personality!"